Description - Outer Space Flex Tiles are the perfect flooring to stir the imaginations of youth and adults alike. This stellar floor kit is durable, high quality, and easy to clean. Constructed using 100% vinyl, there are no contaminants or VOCs to worry about. Blast off with this fun and unique flooring option! Material – Flex tiles are constructed with 100% USA Made Virgin Vinyl. This ensures that the tiles are flexible in order to have the anti-fatigue flooring qualities often associated with rubber flooring but also the long wear life and chemical resistance associated with vinyl tiles. Size – Fully installed design is 11’ 8” x 11’ 8”. Design is 7 tiles wide by 7 tiles deep. 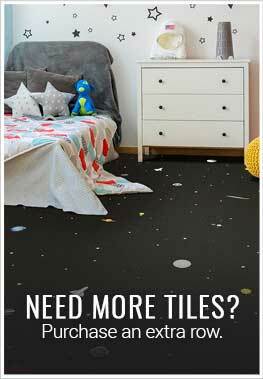 Recommended Uses – Outer Space flex tiles are great for spaces with kids and young adults where a durable flooring option is needed, such as youth centers, rec rooms, classrooms, museums, bedrooms, play rooms, and more. 100% USA Made Virgin Vinyl with no contaminants, fillers or VOCs. Durable, moisture resistant, and easy to install. Portable - glue less installation. Educational and easy to clean flooring kit. One kit covers 11’ 8” x 11’ 8”.